Fumiko Hayashida was a pregnant mother of two when she was interned. SEATTLE — Fumiko Hayashida, whose photo is considered one of the iconic images of the incarceration of Japanese Americans during World War II, died on Nov. 2 at the age of 103. She was the oldest living internee from Bainbridge Island in Washington state. In February 1942, the U.S. government issued Executive Order 9066, authorizing the relocation of people of Japanese ancestry living on the West Coast in order to incarcerate them in isolated and desolate concentration camps. Exclusion Order No. 1, authorizing the first relocation, targeted the Japanese Americans living on Bainbridge Island. One of them was 31-year-old Hayashida, a pregnant mother of two. She was one of 227 members of her community who, dressed in their best clothes, assembled at the Eagledale Ferry Dock on March 30, 1942. 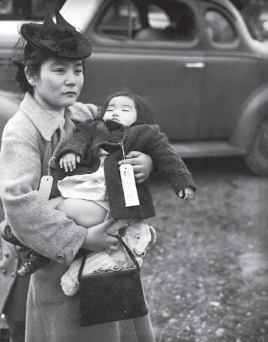 As they waited to be taken off the island by armed military escorts, Hayashida, holding her 13-month-old daughter Natalie Kayo, was photographed by a Seattle Post-Intelligencer photographer. The photograph has since become a lasting symbol of the internment experience. After the bombing of Pearl Harbor, Issei community leaders, including two of Hayashida’s brothers-in-law, were taken away by government agents. In March 1942, all Nikkei on the island were given only six days to prepare for internment. Hayashida and her husband gave power of attorney over their property to their Filipino employees. In testimony before a House subcommittee on behalf of the Bainbridge Island Japanese American Monument Act of 2006, Hayashida recalled, “On the morning of March 30, 1942, the Army trucks rounded us up with soldiers armed with rifles and bayonets. We could only take what we could carry or wear, so we layered up our clothes and had to make hard choices on what items we could fit into a single suitcase. My daughter Natalie was only 13 months old, so I also had to carry her as well. “When we arrived at the Eagledale Ferry Dock at the end of Taylor Road, a Seattle newspaper took a picture of me holding my purse, my little Natalie and her stuffed toy animal. I am humbled that this photograph has been used in numerous historical exhibits, including the Smithsonian Museum’s ‘A More Perfect Union’ and as the image for the Bainbridge Island ‘Nidoto Nai Yoni – Let It Not Happen Again’ memorial. “It was a very sad day. When all 227 Bainbridge Island Japanese Americans – more than two-thirds of us American citizens – walked down the Eagledale Ferry Dock and onto the old ferry, we became the first of some 120,000 Americans of Japanese descent to be forcibly removed and exiled from western Washington, western Oregon, all of California and part of Arizona. About a year later, the family and most of the Bainbridge Islanders at Manzanar voluntarily transferred to the Minidoka camp in Idaho in order to be closer to friends and family from the Seattle area. Hayashida was reunited with her sister, who was raising five children by herself because her husband was being held at a detention camp in Texas. Upon returning to Bainbridge Island, the family found that they had lost everything and had to start from scratch. Hayashida’s husband eventually got a job at Boeing and the family moved to Seattle. Her husband died in 1983. “I am grateful that Presidents Ronald Reagan, Gerald Ford, George H.W. Bush and Bill Clinton have apologized for this shameful period in American history, and that the U.S. Congress passed the Civil Liberties Act of 1988 and the modest reparations that followed,” Hayashida said in her testimony. “These are powerful statements from our nation of healing and honor. Hayashida was the subject of a short film, “The Woman Behind the Symbol,” produced for the Bainbridge Island Japanese American Community by Stourwater Pictures. 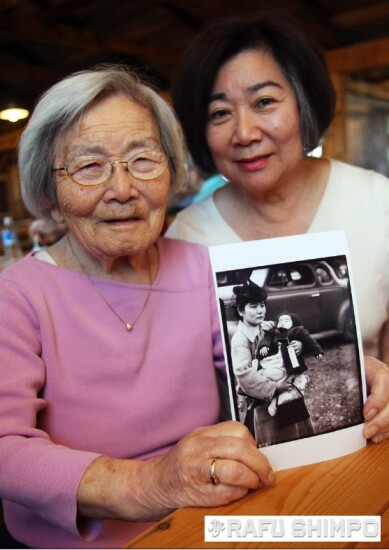 The film followed Hayashida, then 97, and her daughter as they returned to the site of the Minidoka camp, their first trip back together in 63 years. Hayashida, who also visited the Manzanar National Historic Site at the age of 100, spoke about her experiences in classrooms and conferences, and was recognized by the Seattle JACL for her efforts to educate the public. Even at 103, she was a special guest earlier this year at a mochitsuki festival at IslandWood. In addition to her daughter and son Neal, survivors include her sister Midori Yamasaki; grandchildren Dennis Hayashida, Richard Hayashida, Kristine Hayashida Moore, Gary Ong and Paula Ong; five great-grandchildren; and many nieces and nephews. A celebration of life service will be held Sunday, Nov. 16, from 2 to 5 p.m. at Blaine Memorial United Methodist Church in Seattle.